Cut each tenderloin lengthwise, making sure not to go all the way through it. Spread the tenderloins open and flatten with the back of a skillet or meat mallet. Sprinkle generously with salt and pepper and set aside. In a large bowl, mix the stuffing crumbs and pecans together. Set aside. In a small saucepan, heat ⅓ cup Braum’s apple juice with Braum’s butter, sage and thyme until melted. In a medium sized skillet, sauté bacon, onion, celery, and apple until tender. Pour the buttered cider mixture into the bread crumbs. Add in the sautéed bacon and veggies. Stir until everything is combined. 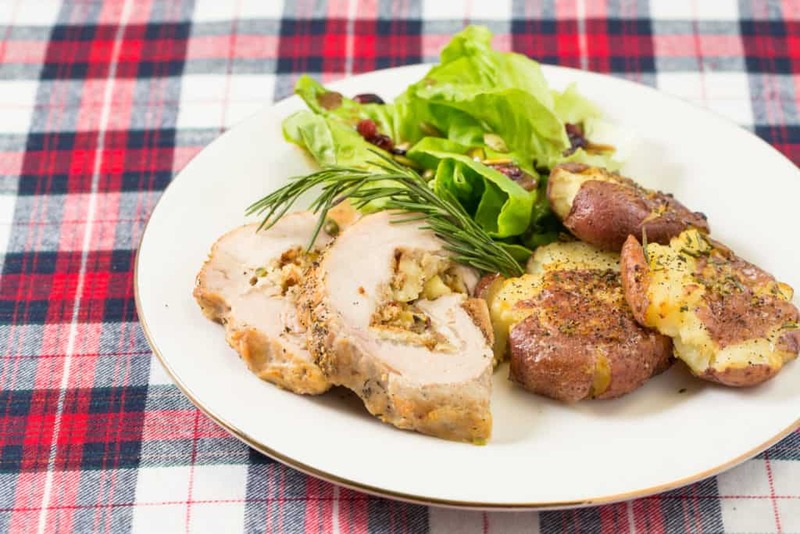 Spread ½ of the stuffing mixture over one flattened pork tenderloin. Roll up jelly roll style and secure with butcher’s twine. Crisscross the halved bacon over the top of the tenderloin. Add 1 cup of apple juice to the bottom of the roasting pan. Roast uncovered at 350° for 1 hour or until cooked through. *Denotes items that are available in Braum’s Fresh Market.